The purpose of refugee policy is primarily humanitarian, and policymakers need to determine how best to help refugees given limited resources and possible disruption to host nations. However, advocates for expanding the number of refugees admitted to the United States have lately portrayed their position as a win-win — not only is refugee resettlement a moral imperative, it is also in our nation's economic self-interest! Last fall, a leaked (and apparently unfinished) report from the Department Health and Human Services claimed that refugees pay more in taxes than they receive in services. A less comprehensive NBER working paper came to the same conclusion last summer. Both papers neglect substantial costs that invalidate their conclusions. (For details, see the links above.) More fundamentally, both implicitly assume that today's refugees are just like yesterday's. In the 20th century, the United States took in several groups of higher-skill refugees — for example, Cubans after Castro's takeover, South Vietnamese after the fall of Saigon, Soviet dissidents in the 1980s, Eastern Europeans in the 1990s, and so on. Today, refugees come mainly from less developed parts of the Middle East, Africa, and South Asia. Refugees age 25 or older averaged 8.7 years of education prior to arrival in the United States. 29 percent of refugees age 25 or older listed their prior educational attainment as "none". About half of refugees age or 25 older did not have a high school diploma upon arrival. Just 16 percent of refugees age 18 and older were currently pursuing a degree of any kind, with the most commonly sought degree being high school equivalency. Recent refugees in 1995 were more educated than recent refugees today, especially relative to natives. For example, a five percentage-point gap in the college graduation rate for refugees vs. natives in 1995 grew to a 21 percentage-point gap in 2015. The education level of recent refugees has declined in both absolute terms and relative to contemporary natives. Source: ORR reports from 1995 and 2015. Data refer to individuals age 16 and older. "Recent refugees" arrived within the past five years of the ORR report year. The 2016 ORR report is not used here because the age range it provides (age 25-plus) is not comparable to 1995 (age 16-plus). 27 percent of refugee households received cash welfare of some kind, most often Supplemental Security Income (SSI). 56 percent of refugee households received food stamps. 34 percent of refugees age 18 or older reported no health coverage. Among those with coverage, about half were on Medicaid or Refugee Medical Assistance. Refugees improve their English over time, but large deficits remain. Among refugees age 18 or older who have lived in the United States between 4.5 and 6.5 years, 53 percent speak English "not well" or "not at all", based on self-assessments. 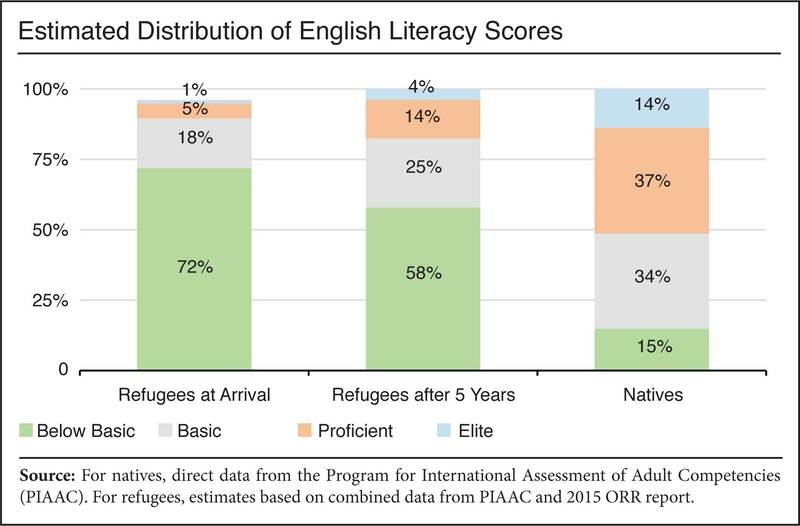 According to rough estimates generated by applying the ORR's self-assessments to English literacy data, more than half of refugees after five years are still "below basic", which is sometimes described as functional illiteracy. On a more positive note, 59 percent of refugees ages 16 to 64 are employed. Although this is lower than the 67.5 percent employment rate for natives, it is perhaps better than expected given the difficult situation refugees find themselves in. Employed refugees age 18 or older earned $12 per hour on average. Under the U.S. government's progressive taxation and spending structure, high-earning Americans tend to receive less in public benefits and services than they pay in taxes, while lower earners receive benefits that exceed the taxes they contribute. Given their low education levels and high rates of welfare use, today's refugees cannot be net fiscal contributors by any plausible analysis. Of course, the United States accepts refugees primarily for humanitarian reasons, not for economic ones. The fact that refugees are a fiscal drain should not by itself determine refugee policy. However, we should be careful not to fall for starry-eyed promises that everyone is better off when refugee numbers increase. There are real trade-offs at stake here, and policymakers should be up front about them.